This isn’t an ordinary league. This is a league you want to be a member of. This is a league of legends. And if you’re not one yet, we’ll help get you there. Where else can you experience an adrenaline rush outside of a gym, but still keep it legal? Where else can you bring your friends (even those hard to impress types) for a night they’ll remember the next morning? Where else can you bring your girlfriend, husband, cousin, colleague or anyone else in your life to enjoy one inclusive activity, all together? Wrangle them up and bring them to our axe throwing league. It’s a place of acceptance, passion and hilarity. It’s a league you can join alone or with others. It doesn’t have any weird initiation customs and it doesn’t require you to wear any silly shirts, hats or uniforms. Our axe throwing leagues are packed with non-stop action and provide the best opportunity for you to focus on really sharpening your skills (we’ll take care of sharpening the actual axes for you). Whether you want to refine your technique, learn some cool tricks or are looking for something to do on a weeknight that’s just cool, Bad Axe Throwing leagues are it. Join a community of legendary people—the kind that only live for REAL fun. Make new friends, share some laughs and participate in friendly competition, because how can you improve without a little rivalry? We promise it’s good for you. So, how do the leagues work? 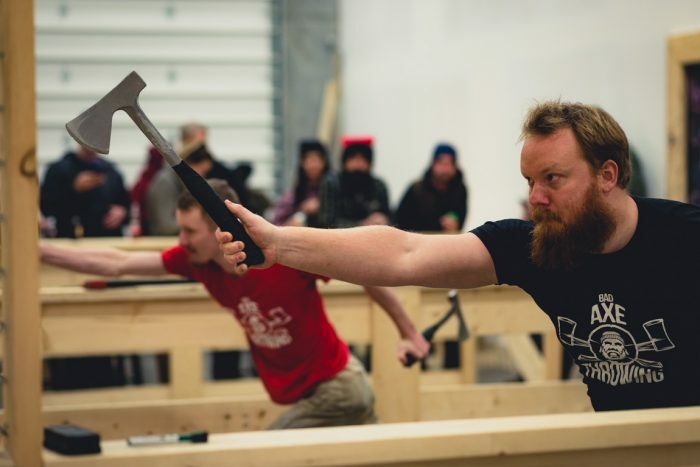 Each axe throwing league runs for 8 weeks, providing you with ample time to warm-up with a few practice throws at the start of each night before you eventually master the sport. 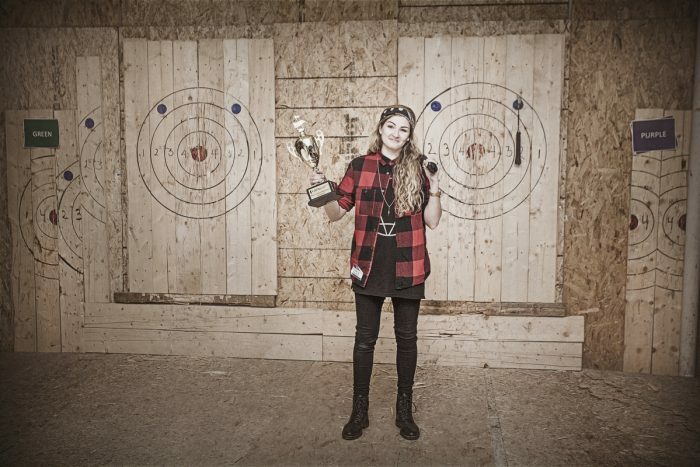 We’ll record your progress, help you fine tune your technique and get you prepared for the final week which sees everyone have a chance at scoring the gold in a real axe throwing tournament. We’ll crown the ultimate champion at the end and celebrate just like true lumberjacks and lumberjills do (you’ll have to participate to find out!). 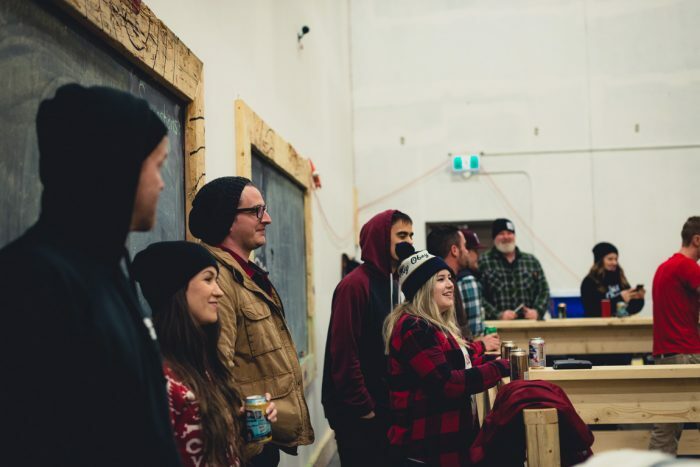 We offer an axe throwing league at every one of our locations across Canada and the U.S! That includes the great cities of Burlington, Chicago, Edmonton, Kitchener, Mississauga, Ottawa, Surrey, Toronto, Vaughan and Winnipeg. If you don’t see your city on the list, don’t worry, Bad Axe Throwing is always expanding and slowly taking over North America. Keep an eye out because we will be establishing an axe throwing league near you. Forget the long drive all the way up north or the need to access a cottage deep in the woods. Forget the need to celebrate a special occasion or have any reason to chuck steel blades at a target. We’ve made it possible for anyone to enjoy axe throwing on the regular by joining a Bad Axe Throwing league. It really is a no-brainer. Try us out, we know you’ve got a legend inside you.